Justin Timberlake has shared the first picture of his baby son. 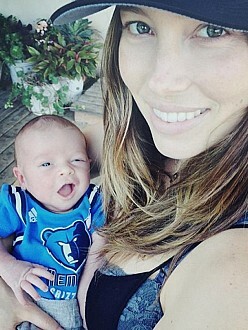 The “Mirrors” singer and wife Jessica Biel recently welcomed their first child, Silas Randall, into the world and the 34-year-old hunk has already passed his passion for sport onto the little boy, posting a picture of him wearing a Memphis Grizzlies jersey ahead of the basketball team’s playoff game against Portland Trail Blazers while cradled in his mother’s arms. The 33-year-old actress is also over the moon about their new arrival. The insider added: ”Jessica sees herself as a mom of boys, so it worked out perfectly.” The duo are quieting adjusting to parenthood at their home in the exclusive Yellowstone Club in Big Sky, Montana.